MY CHINA PLUS is the first Virtual Warehouse all-in-one to distribute on Chinese / Asian markets in an easy, effective and economical way in Shanghai New Free Trade Zone. The solution, based on Food & Beverages distribution platforms activities and experience, is designed for manufacturers / distributors who wish to have direct support in their business operations, promotion and distribution also without the need for a corporate presence in China. How does My China B2B PLUS? NB: The warehouse is into the Shanghai FREE TRADE ZONE. This allows that stored products to pay duties and taxation only when they have been sold! 2) SEND PRODUCTS: The company sends by sea the items to be stored in the warehouse in China. Simultaneously with the product sending, are activated for the incoming products, the procedures with the Chinese authorities for obtaining the Chinese labels. NB This allows to sell immediately the products on the Chinese market (competitive advantage - Ready to Sell) and also be used in fairs / exhibitions as Chinese products, with a big reduction of costs if the same products are shipped from their own country to the same exhibition (about 800 € every 100 kg). 3) MANAGEMENT: Remote monitoring of Virtual Warehouse Platform by My China B2B PLUS Tools. Transfer / transport to other Chinese locations and Asian nations (for fairs, events, sales). 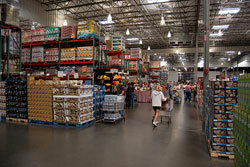 Tours of potential buyers (Showroom) to touch the stored products before buy. Cutting costs (and time) about fairs, exhibitions, workshops and tasting organization, sending samples / products in China and neighboring Asian countries (Hong Kong, Singapore, Japan, Korea etc ...) . Choose "the PLUS" more appropriate for your distribution needs in China and Asia! Copyright © 2014 - 2020 My China B2B. All Rights Reserved.